Ethiopia‘s military launched an attack against « terrorist camps » inside Eritrea today in one of the most serious incidents since conflict between the two neighbors ended 12 years ago. The morning raid was in areas where the « Eritrean government trained, armed, and deployed hit-and-run terrorist and subversive groups, » said government spokesman Shimeles Kemal. He said the attack, which he described as a « proportional military measure » some 11 miles across Ethiopia’s northeastern border, was in retaliation for Eritrea’s backing of groups that have conducted atrocities inside Ethiopia, including a January attack in the Afar region that killed five Europeans tourists. No details about the outcome of the strike, or the Eritrean response from its government in Asmara, are available yet. Mr. Shimeles said that Eritrea’s army is too weak to launch a counter-attack and that Ethiopia would take similar action if it continued to back subversive groups. Despite today’s bellicose move, said Shimeles, talking is the way forward. « While Ethiopia reserves its right to take retaliatory measures against Eritrea’s violent attacks, the government still upholds that the conflict between the two countries can only be resolved through negotiations and dialogue, » he said. It’s “not in Ethiopia’s interests” to return to hostilities, Ethiopia’s State Minister of Foreign Affairs Berhane Gebre-Kristos said last month. The attack sends a different message and is the culmination of an increasingly aggressive stance from Ethiopia toward its neighbor. 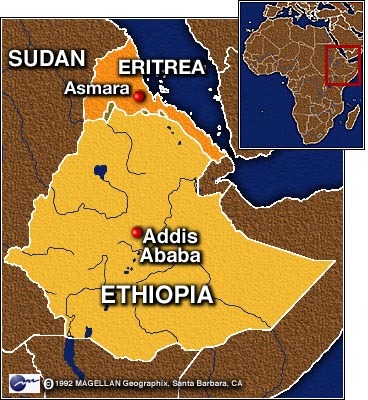 Last year Ethiopia said it would back rebels seeking to overthrow the government in Asmara. Recently it has also been applying diplomatic pressure on Eritrea, with which Ethiopia fought a two-year war from 1998-2000 that killed some 70,000 people. Eritrea, which has been led by President Isayas Afewerki following independence from Ethiopia in 1993, has been under United Nations sanctions since 2009, primarily for supporting Somali militants, including the Al Qaeda-linked Al Shabab. Ethiopia also accuses Eritrea of backing groups such as the Oromo Liberation Front, or OLF, which is fighting for autonomy for the largest and most-populous region of Ethiopia. Analysts say the hostile relations are partly due to rivalry between the two heads of state, President Isayas, and Ethiopian Prime Minister Meles Zenawi. The two led separate rebel movements that overthrew the Marxist military junta that ruled Ethiopia until 1991. The government in Asmara says Ethiopia is the aggressor and that it has duped the international community into treating Eritrea as an international pariah. A United Nations group monitoring the sanctions said Eritrea was behind a foiled OLF plot to bomb Addis Ababa during January 2010’s African Union summit. Last year, Ethiopia tried to have stringent economic sanctions placed upon Eritrea that would have crippled its booming mining industry and cut revenue from an important tax on remittances. Officials from Addis Ababa have repeatedly warned the international community that they will deal unilaterally with the Eritrean threat if it does not act. The « magnitude and nature » of this attack makes escalation likely, Ethiopia analyst Jawar Mohammed says. Eritrea has been conducting military drills, possibly in anticipation of an attack since Ethiopia accused it of murdering the tourists, he says. « It is quite likely that Eritrea will respond in kind. And this tug-of-war could escalate into a full blown confrontation, » he believes. Eritrea will now focus on a diplomatic offensive to again try to convince the world that it is the victim of Ethiopian aggression, while launching one of its proxies to attack its enemy, says an adviser to the Ethiopian government.